Her upwind performance is not quite as good, her tacking angle would be 4 or 5 degrees more than a marconi rigged boat. On a beam reach, I'd say, about the same, on a broad reach or run, she may have the advantage. With a gaff main sail, there is more sail area higher up the mast, so, in lighter wind conditions, you have more sail up where the wind is moving faster, than you'll have with a marconi rigged boat. 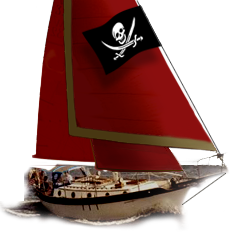 I've never raised her topsails, though, so, that might improve her upwind characteristics considerably (not to mention adding a lot more sail area). Gaffs are really comfortable boats to sail, mainly because with their wooden boom and gaff, the main sail doesn't luff very much when coming about or gybing, so, tacks are much less dramatic. Same for raising or lowering sail. If you are a harbor racer, that likes short-tacking around a tight course, you'll probably prefer the marconi rig, but if you're a long distance cruiser, it's hard to beat a gaff-rigged boat.